I went out to Harlequin Gardens again, for some plants and some advice. Then I followed my mother's (z'l) counsel: "Better to ask pardon after than permission before..."
I took the plants, some good soil and a gallon of water to Green Mountain Cemetery. 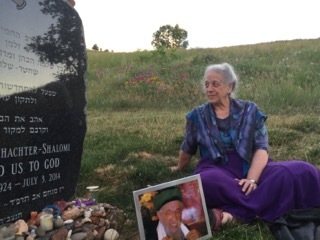 Some weeks ago, thanks to the gracious generosity of Helena Foster, a beautiful stone bench was installed at the foot of Reb Zalman's grave. Because the ground slants upward, on the west side, there was a precipitous drop of about ten inches, from the rising ground to the cement base of the bench. I came with soil, a gallon of water and eight small starts of creeping thyme, a modest and fragrant ground-cover. I planted them where the soil slanted down towards the bench, watered them, and told them how happy I was that they were there, and that I hoped they would be happy too. I will return with a tallis and a siddur, and tuck them into the shelf in the bench, for use by anyone who wishes to davven there. It was a very satisfying thing to do. I'm not entirely sure why, then, I sat by the newly planted thyme and burst into tears.